Its summer, and you want to be outside enjoying the sunshine, not indoors sweltering over your vacuum cleaner. 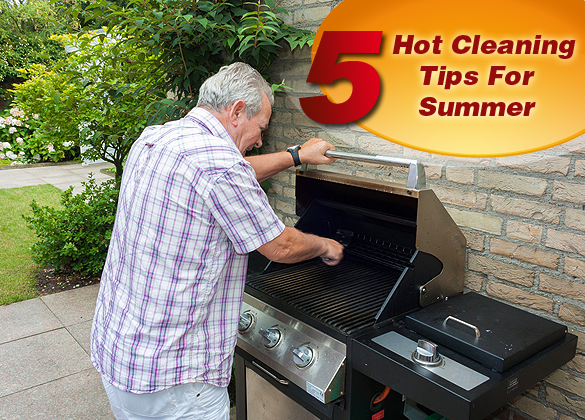 Summer also brings its own cleaning challenges, from greasy grills on your BBQ to sunscreen staining your clothes. However, dirt doesn’t take a vacation and we all know putting it off just makes it worse. Don’t feel you have to do all the cleaning yourself, either. If the kids are home, ask (or bribe!) them to help get the job done quickly so you can all get out there and enjoy the summer. Start cleaning your BBQ when the grill is still warm. Jolie Kerr, author of the column Ask a Clean Person, says the grill should be scrubbed with a wire brush. If this does not work, you may have to use oven cleaner on the grill, but remove it first! Oven cleaner can have toxic fumes, so if you are not using a green product, make sure you use it in a well-ventilated area (like outdoors). Sunscreen might leave stains on your clothes if it reacts with your laundry detergent. Make sure you rinse any sunscreen off before washing, advises Kerr. This usually happens with swimsuits, which fortunately are easy to rinse. Rinsing also gets rid of chlorine or salt, and extends the life of your swimsuits. Another great tip from Kerr: don’t wring your swimsuit after rinsing. This can damage the elastic. Go green…or yellow. Summer fruit is not just for cocktails – lemons are great for cleaning stainless steel like faucets and fridges. Donna Smallin, >Unclutter.com’s cleaning expert, advises us to rub half a lemon over the stainless steel, then simply wipe with a microfiber cloth. It smells great, too. Washing machines can begin to smell in summer, especially if the humidity is high. They also begin to smell if you only wash in cold water. You can banish the smell by running it empty, with detergent, on a hot cycle. Make sure you leave the door open afterwards so circulating air dries it out, advises Smallin. Chilled drinks create condensation on the outside of the glass, which can leave white stains on wood. But don’t panic if someone leaves a water ring on your wooden coffee table. Act fast, and dab full-fat mayo on the water ring. Wait for an hour, then wipe with a cloth. Oil can be substituted for mayo.